Originally this house was built in 1902 as a residence for the Chief Minister of Kelantan, Encik Hassan bin Mohd Salleh who served from 1900-1920. Commensurate with his high ranking status, the house was built with the highest quality tropical hardwood species known locally as cengal (neobalanocarpus heimii). Parts of the walls feature decorative carved panels in solid relief known as Janda Berhias, a method popular on the East Coast of Peninsular Malaysia. The roof has a multi-tiered pyramid structure known as Bumbung Limas Bungkus and is covered with clay roof tiles called Genting Singgora, named after the province of southern Thailand where they originate. The hexagonal shaped porch (anjung) resembles those of the nearby Istana Balai Besar and Istana Jahar. The doors, windows and walls, both exterior and interior, are a work of art with intricate carved motifs. The architectural style of the building has been described as 20th Century Malay-Kelantan-Pattani. The building has been renovated and upgraded a number of times - firstly in 1917 when its use was converted from residence to office and school by the Majlis Agama Islam Kelantan (Kelantan Islamic Council) and again in 1962, 1991 and 2007. The major upgrade in 1991 was after the Council vacated the building and it was converted into the Islamic Museum. 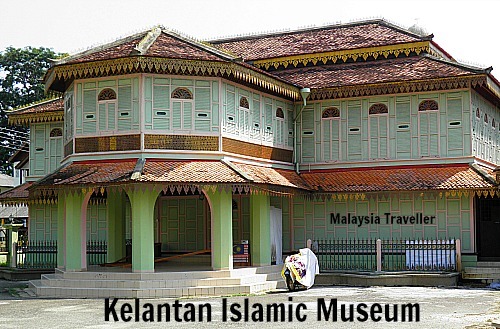 The museum tells the history of how Islam came to Kelantan which gained the title of Veranda of Mecca or serambi Mekah - (Aceh in Sumatra is also referred to by the same title). The museum contains information on the state muftis, the role of the Sultan, who is defender of the faith, examples of Islamic art and crafts together with photographs of Islamic historical sites and of belongings of Prophet Muhammed. Well worth visiting both for the architectural value of the building as well as the exhibits inside. The museum is open from Saturday to Thursday from 8.30am to 4.45pm. I have marked the exact location on the map on my Kota Bharu Walking Tour page. To find accommodation in Kota Bharu to suit all budgets and tastes at discounted prices please click on the Agoda advert or search box below.